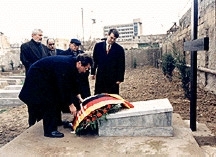 German Foreign Minister Klaus Kinkel places a wreath at the German War Cemetery in Baku as German Ambassador Michael Schmunk and Hasan Hasanov, Azerbaijan's Minister of Foreign Affairs look on. Kinkel was the first Western Foreign Minister to officially visit the Azerbaijan Republic since its Independence. (December 22, 1995). Photo: Kühler of Bundesbildstelle, Bonn. German business has a long tradition in Azerbaijan. The first German settlers migrated to Azerbaijan in 1819 because of poverty brought on by the Napoleonic Wars. They first settled in the area of Helenendorf (Khanlar) near Ganja, bringing with them the art of wine and champagne-making. Gebruder Vohrer (Vohrer Brothers) began to affix their own label on bottles in 1847. Gebruder Hummel (Hummel Brothers) started their wine-producing business in 1878 and constructed the first brandy factory in 1895. Concordia Wine, originally founded in Helenendorf (1907), set up branches all over the former Soviet Union, including a shop on the corner of Bul Bul and Nizami Streets in Baku. Gebruder Siemens (Siemens Brothers), one of the world's leading electronic firms today, purchased the Kedabek copper mines in the mountains west of Ganja in 1864. They modernized mines and factories, built a railroad system, villages, and bridges, many of which can still be seen today throughout northern Azerbaijan. By 1877 the Siemens Copper Mines were already operating "in the black." Left: Early German Factory. Bottling section of Concordia Wine Company, Baku, 1927. World War I and the intrusion of Bolshevik Revolution abruptly curtailed the business activities; many German settlers in Azerbaijan were even deported to Siberia and Kazakhstan. During the Cold War period, East German (GDR) state companies cooperated closely with their partners in what was then known as Azerbaijan Socialist Republic. Some East Germans received their engineering degrees at Baku's academies, particularly at Baku's highly regarded Oil Academy. Soon after the Azerbaijan Republic became an independent state in late 1991, German businesses again found their way to Azerbaijan. Although Germany has never been involved in offshore oil production as there are virtually no German-based multinational oil companies, Germans are beginning to find their niche in the ever-growing Azerbaijan economy. Nearly 30 German companies or German-Azerbaijani joint ventures have already been established. Siemens AG (as it is now called) was among the first. 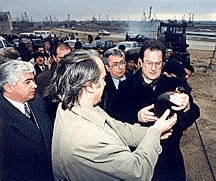 Left: German Foreign Minister Klaus Kinkel receives a bottle of oil from AzGerNeft oil fields in Baku (December 22,1995). Photo: Kühler of Bundesbildstelle, Bonn. Many trading firms were among the pioneers to Azerbaijan. Wirtgen, a road construction machines company, completed Baku's new airport runway last year. Grunewald is producing oil with AzGerNeft on Nobel's old fields north of Baku. Convinced that Azerbaijan would become the economic hub of the Transcaucasus, Lufthansa German Airlines opened direct flights from Frankfurt to Baku and beginning April 1st, they'll open routes between Baku and Ashkhabad, linking Turkmenistan to the Caucasus and Europe. Their motto? "We offer you the whole world from Baku!" Lufthansa Cargo, with its legendary German efficiency and reliability, is already providing Baku's new industries with tons of urgently needed goods on a weekly basis. During the last century, covered wagons were an important and highly successful manufacturing business for German settlers in Helenendorf. Today, renowned German auto manufacturers such as Mercedes Benz and Volkswagen are becoming established in Baku. Deutrag is drilling off-shore for AIOC. Gieseche and Divrient (Munich) printed what Azerbaijanis familiarly call the "Shirvan" (the 10,00 manat bill). Grimma, Gabeg, Liebherr, Erdgas Gommern, Ferrostaal, Militzer and Münch are also among those who have set up offices. Many others, such as Deminex are exploring possibilities to invest. Construction companies such as Deutsche Babcock, and Bilfinger and Berger are involved; while Thyssen, MAN and Mannesmann Demag are applying for oil pipeline contracts. Deutsche Alcatel and Siemens want to get involved with the communications market, while chemical and pharmaceutical giants such as Bayer Leverkusen, Hoechst, Merck and BASF are looking for opportunities in the promising Sumgait-UNDP Industrial Zone Project (where plans exist to develop a Free Economic Zone-FEZ) which is also supported by the German government. Sumgayit should become the second pillar of Azerbaijan's economy after oil. The export volume between Azerbaijan and Germany (72.1 million German Marks in 1994) is still quite modest, however, and according to the German government, there is much more room for investment. In May 1995, German Minister for the Economic Cooperation and Development, Carl-Dieter Spranger, brought a delegation of 20 representatives from German business and industry to visit Baku. Foreign Minister Klaus Kinkel became the first western Foreign Minister to officially visit Azerbaijan in December 1995. Thirty representatives accompanied him. Together with Azerbaijan's Foreign Minister, Hassan Hassanov, they signed an "Investment Promotion and Investment Protection" agreement to foster bilateral economic and financial cooperation. Further agreements to avoid double taxation are being prepared. An air traffic agreement is already in effect. Kinkel announced that a German Chamber of Commerce, representing the interests of German private business, trade and industry will open in Baku this year. HERMES, the German government's export credit insurance system, is "in the pipeline." Germany has provided 6.3 million German Marks through its "Technical Cooperation Program" and another 15 million Marks through its "Financial Cooperation Program" to foster Azerbaijan's economic transformation. Kinkel promised President Heydar Aliyev that Germany would provide assistance for economic, financial and legal experts with experience in transitional societies as Germany itself has just gone through the difficult process of integrating and reforming the socialist system of former East Germany. German business is critically assessing the reform policies of the Azerbaijani goverment and are awaiting the implementation of the long-awaited privatization laws, reform of civil and business laws, customs and tax system, and a modern and efficient business and trading culture. Today, prospects for German-Azerbaijan economic cooperation are excellent. Trade figures for the first eight months of 1995 showed an increase of 43% over the past year. Many new German companies are already on the move, while others are anticipating the next impetus that will result when President Heydar Aliyev meets German Chancellor Helmut Kohl in Bonn in July.